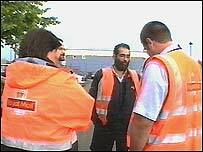 Article about the Royal Mail wildcat strike and other wildcat actions in the UK in 2003. We could have borrowed this headline of last weeks English Anarchist publications, but we actually nicked it from the Financial Times of the 6 November. The wildcat strikes are back, after the work stoppages at Heathrow airport, there have been wildcat actions by the postal workers and the fire fighters in the last two weeks. How can this be? The financial times sways between panic and mechanic. Panic: "Wildcats breed wildcats, unofficial action by postal workers spread across the country like wildfire, as the 24-hour news media fanned the flames." Mechanic: The old labour legislation of the Tories is to blame. If the union strikes did not have to give four weeks notice, then there would not be any need for these unofficial actions. The labour legislations need reworking." There are a few impressions from events, newspaper articles, an early morning visit to a picket line and a talk with a friend who is a postman himself. * The workers should be able to cover various jobs, or "demarcation", e.g. the drivers should deliver letters, if there is not enough driving work. * Workers should stay longer or leave earlier according to the amount of work coming in. * The union should be focused on co-operation and the shop stewards and other reps would have less paid time off for union work. At the same time the management are trying to undermine local autonomy with new technologies, which looks pretty bad so far. The commissioned new modern European sorting office near Heathrow, that was due to open in January 2002, faces even longer delays in being ready. In May 2003 it became known that the costs have already risen from the planned 180 million pounds, 380 million pounds. This new sorting office would replace nine other sorting offices, which have all been problematic centres of workers power. In August 2003 the CWU (Communication Workers Union) called for a national strike for higher wages. A month of internal repression from the management and a media campaign against "post chaos" meant that by September, the vote was 48,038 against the strike and only 46,391 for it. But we can see that this vote against a national strike, which was only ever going to be a nicely timed union token, is not necessarily a sign of the desperation of the postal workers. As it turns out they would rather trust their own unmediated strength and organisation, as some calculated symbolic action. The wildcat strike began at the end of October 2003 in, at the same time and independently, at Greenford mail centre, which was a knock on from a dispute at the nearby delivery office at Southall and at an office in Dartford, London, after a driver refused to deliver the letters that were building up due to the official strike, to another office with other workers. He was sacked for this and his 400 colleagues reacted immediately with a spontaneous work stoppage. The management ensured the spread of the strike by attempting to take the post to other offices. The management knew it was a provocation, but reckoned without such decisive action. Within eleven days 20,000 to 25,000 workers were out, mostly from London and the South East. More than 16 million letters per day were piling up and after a few days 10,000 post boxes across London were sealed off. A few companies were complaining such as a camera film developers whose factories were not receiving the films to process, and the supermarket Tesco threatened to give their business to a private firm. But this was a part of the propaganda war as it was only one minor contract to deliver books and it turned out not to be a definite cancellation anyway. There were emergency meetings between the post service management, the government, union officials and employer bodies. The management were publicly trying to reduce the issues to London Weighting in order to isolate them from the rest of the country. On the 29 October the CWU head office sent a standard legal disclaimer as an open letter "How to solve the problem of unofficial strikes", in which they officially distance themselves from the strikes and stated that management are holding them responsible none the less. They called for immediate return to work without repressions. "It was read out by the head manager at our strike meeting to try and put us off - when the union guy came he downplayed it as what 'they have to say and say every unofficial strike'." The management did not respond, but instead sent employees, mostly managers who can also do some work, from other parts of the country in as scabs into the conflict zone. They were delivering special items if necessary - which they tried to maintain during the strike - the lucrative 'special' priority services, but by the end they had abandoned it. On 1 November the Guardian published the internal memo sent by the central office to the local post managers instructing them how to deal with the strikers. Basically to use every kind of spying technique going from the use of video cameras to cutting in on strike meetings in order to take the "right steps" against the strikers. Workers told us that managers in post workers uniforms were driving around London in post vans in order to give the impression that the strike was not going so well. "On the 31 October we went to a picket line outside Mount Pleasant, a large sorting office in Central London. It wasn't a picket line in the usual sense, but about 20 middle aged men standing around outside the main entrance and chatting to each other, while a few employees slipped more or less hastily into the building. No leaflets, collection buckets or posters. A security guy was standing in the entrance but didn't really have hard job, as there were no attempts to stop people going in. We talked with one striker, probably a union rep. He pretty much told us what we knew from the media, or what one would say to strangers in such a situation: "We have tried not to have this strike, but the management reacted with repression. Here in Mount Pleasant 99% of the workers are out. The strike is locally organised." Not content with the offerings of the Media and left with questions from our Strike-Hag experience, we visited a friend a few days later, who has worked as a postman for the last few years. There was leek and potato soup to go with the weather and his toddling two-year-old daughter. The management seemed better prepared than the last unofficial strike in 2001. This strike had a bit of a lockout character, coming from management's hope to enforce the national agreements locally. On the other hand there was less conflict between the union leaders and the rank and file than last time because since then a more 'radical leadership' was elected. It is the shop stewards who are exchanging information between the striking centres. The official union publication is worse than useless. Better is the newsletter from the SWP orientated rank and file group 'Postworker'. Where we work we got to know about the beginning of the wildcat strikes from a union rep, our shop steward. He called for a meeting to tell us what was going on. (The meetings take place in the canteen, or in the car park). So, everybody went to this meeting, and the first thing is the main manager there, wanting to talk to us about what was going on, tried to read out the disclaimer from the CWU, but we didn't give him a chance. The management were holding the union guy in their offices, in line with the official instructions of what to do in such situations. They later let him speak, but tried to catch him out 'inciting' us to strike. He tried to get round this by simply telling us what was going on with the strike and telling us that it was up to us, how we wanted to react. When a bloke, who was not in the union called for a strike, the union guy said 'Well here is a suggestion, let's vote on it.' It was then just a formality where everyone raised their hands and voted for a strike. There may well have been a few there who would have wanted to not strike right away, but just refused the work from the striking centres, or scab work. Sooner or later we would be asked to deal with work coming from the mail centre that was already on strike and thus this work would have been handled by managers to get it to us, and at that point we would have refused and walked out. The choice before us then was to wait till we were actually asked to deal with some work that was 'scab work' or to more pro-actively say 'they've suspended people at the mail centre', they are out, lets go out in support. It was this more aggressive and immediate response that the non-union rep proposed and the union rep took as the suggestion for us to vote on. For most of the people being on strike meant staying at home. There was no need for a real picket line, because it was clear that everyone would strike anyway. For 170 workers there were at most 20 to 30 people on the picket line. There are also casuals working with us, but they didn't cross the picket line. (Casuals come from agencies and are called up as and when needed. There is definitely a division between them and us. There are also post-workers on limited contracts, but they work alongside us and are treated by the workers and managers the same as the permanent staff. Most do get permanent contracts eventually). The only ones who ignored the picket line are the manager and cleaning workers, who we don't have a good connection with anyway. The atmosphere goes between a barbeque evening, to 'we'll show them' to fear that the strike could go on too long. After the negotiations the CWU and the management called for a return to work as they had a settlement. Because the next morning we still didn't know anything about the content of this agreement, we carried on striking. One day later it became clear that there would be no repression of the strikers and no local 'back to work contracts', which were not voted on. The main feeling was 'we won'. The basis for the strikes was an attempt to undermine the union and push through changes that had not been voted on. Now it is clear that they 'have to talk to us'. If the management would have managed to break the strike things would be worse now. It was a defensive, but successful strike. The issue is we broke the anti strike legislation. In this case even the headquarters union official were not trying very hard to enforce the law and the local union reps were actively working against the law. We broke through the unions officials 'anti-strike' politics again, and we were successful when we did.